This analysis used fee-for-service (FFS) Medicare Part A and B claims to examine the characteristics of Medicare beneficiaries who use inpatient psychiatric facilities (IPFs), the types of inpatient and outpatient care these beneficiaries receive throughout the year, and the types of care these beneficiaries receive before and after their IPF stay. Most FFS Medicare beneficiaries who use IPFs have primary diagnoses of schizophrenia, major depressive disorder, and bipolar disorder, but Alzheimer's and related diagnoses are also common. During 2008, Medicare beneficiaries who used IPFs had relatively high levels of emergency room and acute care use compared with all FFS Medicare beneficiaries. The majority of IPF admissions came from physician referrals or emergency rooms, and most IPF patients were discharged to their home or to self-care. Around one-third of beneficiaries had some type of inpatient care--either an IPF stay or an acute care stay--in the 30 days before their IPF stay, and around one-quarter had an IPF stay or an acute care stay in the 30 days after their IPF stay. In addition, emergency room visits were common 30 days before and after the IPF stay. In the 30 days before and after their IPF stay, Medicare beneficiaries were less likely to have an outpatient mental health visit than an outpatient encounter unrelated to mental health. The term "inpatient psychiatric facility" refers to either an inpatient psychiatric hospital or distinct psychiatric units of acute care hospitals and critical access hospitals. IPFs are certified under Medicare as an institution primarily engaged in providing psychiatric services for the diagnosis and treatment of mentally ill patients, as well as maintaining clinical records for determining the degree and intensity of treatment and staffing requirements. For a distinct part psychiatric unit to be certified as an IPF they must meet the clinical record and staffing requirements in 42 CFR 412.27 for a "psychiatric bed" (CMS, 2010). Medicare beneficiaries receive IPFs coverage through Medicare Part A, also known as Hospital Insurance. If a beneficiary is receiving care in an IPF Part A covers up to 190 days as a lifetime limit. A beneficiary may have multiple benefit periods, up to the 190 day lifetime limit (Your Medicare Coverage, n.d.). Medicare beneficiaries in IPFs have complex conditions that require sustained engagement with physical and mental health care providers. People who receive care from IPFs are at risk for a range of negative health outcomes, but surprisingly little is known about their patterns of care. To fill this knowledge gap, we conducted an analysis to examine: (1) the characteristics of IPFs; (2) the characteristics of Medicare beneficiaries who use IPFs; (3) the types of inpatient and outpatient care these beneficiaries receive throughout the year; (4) the types of care they receive right before and after their IPF stay; and (5) the types of care they receive 30 days before and after their IPF stay. Our findings are intended to help identify points in the health care system that could be targeted to reduce preventable IPF admissions and readmissions. The findings may also inform efforts to develop and implement quality measures focused on this population. This analysis builds on an earlier project conducted for U.S. Department of Health and Human Services (HHS) Office of the Assistant Secretary for Planning and Evaluation--with support from the HHS Centers for Medicare & Medicaid Services (CMS)--to develop a quality measure that uses Medicare claims to assess follow-up care after IPF discharge. We used inpatient Medicare claims from calendar year 2008 and the Area Health Resources File to describe the characteristics of IPFs that provided care for FFS Medicare beneficiaries. We then used Part A and B Medicare claims to summarize the demographic characteristics, diagnoses, and inpatient and outpatient service use of FFS Medicare beneficiaries who received care in IPFs. When examining inpatient and outpatient use of services, we first analyzed beneficiaries' receipt of care for the entire 2008 calendar year (using Part A and B claims). We then analyzed the care that beneficiaries received directly before and after their IPF stay (using admission and discharge codes from IPF inpatient claims) as well as their care in the 30 days before and after their stay (using Part A and B claims). The sample for this analysis consisted of 303,096 FFS Medicare beneficiaries who had 462,688 Medicare-paid IPF stays in 2008. These FFS Medicare beneficiaries comprise roughly one-quarter of all IPF patients (Medicare Payment Advisory Commission, 2010). This sample included beneficiaries enrolled only in Medicare Part A and B as well as dual-eligible beneficiaries--those enrolled in both Medicare Parts A and B and Medicaid--during 2008. See the technical appendix for additional details on our methods. Our findings have several limitations. First, we present inpatient and outpatient service use at the national level, but state-level and facility-level findings vary. Second, our service use rates do not allow for an analysis of episodes of care. For example, if a beneficiary were admitted to a psychiatric unit IPF from a general hospital's emergency room, this would be shown as an IPF stay and an emergency room visit--not as a single episode of care involving both the emergency room and IPF. Finally, the analysis relies primarily on Medicare claims data; some people may have received care that was not reimbursed by Medicare; this care would be unobservable in the data we used. What are the characteristics of IPFs that serve Medicare beneficiaries? Psychiatric units account for most IPFs in the country, but freestanding IPFs account for most psychiatric beds. IPFs that receive Medicare reimbursement include freestanding IPFs and psychiatric units in general as well as critical access hospitals in the 50 states, the District of Columbia, and Puerto Rico and other United States territories. In 2008, psychiatric units--particularly units in general hospitals--represented over 70 percent of IPFs in the country. Freestanding IPFs accounted for only 27 percent of IPFs, but they accounted for around 60 percent of IPF beds in the country (Table 1). Freestanding IPFs had around four times the average number of beds as psychiatric units (137 beds in freestanding IPFs versus 32 beds in psychiatric units, on average). Most IPFs are in non-rural settings and non-low-income counties, but almost all are in mental health care shortage areas, as defined by the Health Resources and Services Administration. Nationally, in 2008 less than one-quarter of IPFs were in a rural setting, and only 15 percent were in a low-income county (Table 1). SOURCE: Medicare FFS inpatient claims from IPFs for calendar year 2008, POS file, and Area Health Resource File. Rural is defined as non-metropolitan, based on the metro/micro indicator in the Area Health Resources File. A low-income county is a county with a median household income lower than $39,000, based on the 2008 median household income variable in the Area Health Resources File. A mental health care shortage area is an area with 1 psychiatrist for every 30,000 or more people. What are the characteristics of Medicare beneficiaries served by IPFs? More than half of FFS Medicare beneficiaries served in IPFs are also enrolled in Medicaid. In 2008, 56 percent of Medicare beneficiaries who received care in IPFs were dual-eligible beneficiaries (Table 2). The average age of Medicare beneficiaries served in IPFs was 59, compared to the average age of 71 for all FFS Medicare enrollees (Chronic Conditions Data Warehouse, 2014). Overall, IPFs served a slightly higher percentage of women than men (53 percent versus 47 percent), and beneficiaries served by IPFs were predominantly White (followed by African American). Schizophrenia, major depressive disorder, and bipolar disorder account for most primary diagnoses in IPFs, but Alzheimer's and related diagnoses are also common. Schizophrenia was the most common primary diagnosis in IPFs (25 percent of patients), followed by major depressive disorder (23 percent) and bipolar disorder (18 percent; Table 2). However, Alzheimer's and related conditions accounted for 15 percent of primary diagnoses. Recent studies have noted an increase in diagnoses of this kind at IPFs, potentially linked to a higher incidence of Alzheimer's and dementia among Medicare beneficiaries and the growing practice of nursing facilities transferring dementia patients to IPFs for stabilization (Moran Company, 2014). Substance use and Alzheimer's and related diagnoses are common comorbidities. With respect to patients' full set of diagnoses--including primary, secondary, and additional diagnoses during the IPF stay--nearly one-quarter of IPF patients had a substance use diagnosis, and one-quarter had Alzheimer's or dementia. These conditions often accompany beneficiaries' primary diagnoses of schizophrenia, depressive disorder, and bipolar disorder (Table 2). Psychiatric units and freestanding IPFs serve beneficiaries with somewhat different demographic characteristics and diagnoses. In 2008, over 210,000 FFS Medicare beneficiaries had at least one stay at a psychiatric unit, and over 90,000 beneficiaries stayed at a freestanding IPF. Beneficiaries who received care from psychiatric units were more likely to be female and tended to be older, on average, than patients who received care from freestanding IPFs (Table 2). In addition, psychiatric units served a higher share of people with Alzheimer's and related diagnoses than freestanding IPFs (30 percent versus 12 percent in freestanding IPFs). In contrast, freestanding IPFs served a higher share of people with substance use diagnoses (31 percent in freestanding IPFs versus 20 percent in psychiatric units). SOURCE: Medicare Part A inpatient claims from IPFs for Medicare FFS beneficiaries, calendar year 2008. NOTE: Sample size is 303,096 FFS Medicare beneficiaries who had at least 1 IPF discharge from January 1 to December 31, 2008. The numbers in this table are at the beneficiary level (that is, the table shows 1 observation per unique beneficiary rather than each individual discharge). Beneficiaries who stayed at psychiatric units and freestanding IPFs in 2008 were assigned to either freestanding or psychiatric unit based on their last stay of the year. In cases of multiple IPF stays with alternate diagnoses, this is the diagnosis for the last IPF stay of the year. This includes diagnoses of alcohol and drug psychoses, alcohol and drug dependence, and drug non-dependence. This includes diagnoses of dementia and other cerebral degenerations. Length of stay was calculated when admission and discharge dates were present. The length of stay calculation includes stays that began before 2008 but not stays that extended past 2008. Because this is a beneficiary-level table, in cases of multiple stays, we calculated the length of stay for the last stay of the year. As a sensitivity test, we examined lengths of stay excluding stays that began before 2008, which resulted in an average length of stay of about 13 days (as opposed to 16 days). Length of IPF stay varies substantially by IPF type and diagnosis. Including IPF stays that began before 2008, the average length of stay at freestanding IPFs was 26.6 days (35 percent were longer than two weeks), compared with 11.5 days at psychiatric units (23 percent were longer than two weeks). Length of stay varied by primary diagnosis in both freestanding IPFs and psychiatric units; people with schizophrenia had the longest average length of stay, followed by psychosis and Alzheimer's disease (Figure 1). NOTE: The sample size is 303,096 FFS Medicare beneficiaries who had an IPF discharge from January 1 to December 31, 2008. The data shown are at the beneficiary level, with 1 observation per unique individual. In cases of multiple stays, we only counted the length of stay and diagnosis for the last stay of the year. What care do IPF patients receive in the community? Medicare beneficiaries who use IPFs also use emergency room, acute care, and skilled nursing facilities (SNFs) frequently. Nearly 90 percent of FFS Medicare IPF patients had an emergency room visit in 2008, and nearly half had an acute care hospital stay in 2008 (Figure 2). This is much higher than the rates of national emergency room and acute care use among all Medicare FFS beneficiaries, which were 30 and 21 percent, respectively, in 2008 (CMS, 2011). In addition, 26 percent of IPF patients used SNF services during 2008--by far their most frequently used type of post-acute or residential care paid for by Medicare. This is around five times the national average of FFS Medicare beneficiaries (5 percent) who used SNFs at least once in 2008 (Medicare Payment Advisory Commission, 2010). In contrast, less than 10 percent of IPF patients used intermediate care, psychiatric residential treatment, or rehabilitation services at any time in 2008. 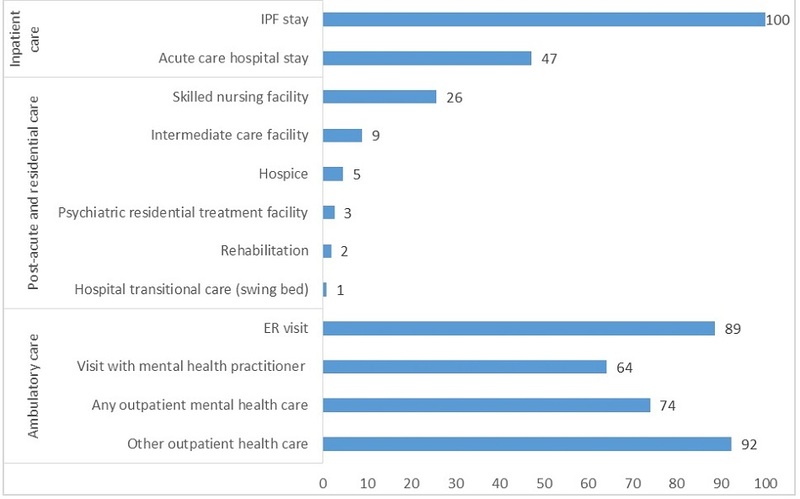 Use of SNF, acute care, and emergency room services is higher among beneficiaries who received care from psychiatric units compared with freestanding IPFs. In 2008, the proportion of beneficiaries who had SNF care was 15 percentage points higher among those who received care from a psychiatric unit versus a freestanding IPF (not shown in Figure 2). Likewise, the proportion of beneficiaries who had an emergency room visit or an acute care hospital stay was around 10 points higher among those who received care from a psychiatric unit versus a freestanding IPF. In part, these higher rates of emergency room and acute care use reflect direct transfers between the emergency room, the psychiatric unit, and other departments within general hospitals. Higher rates of SNF use among beneficiaries in psychiatric units likely reflect the higher average age and higher prevalence of Alzheimer's diagnosis among these individuals, compared with beneficiaries who receive care from freestanding IPFs. SOURCE: Medicare Part A and B claims for Medicare FFS beneficiaries who had an IPF stay in calendar year 2008. NOTE: Sample size is 303,096 FFS Medicare beneficiaries who had an IPF discharge from January 1 to December 31, 2008. This is a beneficiary-level table, with 1 observation per unique individual. ER visits were counted without regard for diagnosis (all were included). A visit with a mental health practitioner includes an OP visit, an intensive OP encounter, or a partial hospitalization with a psychiatrist, psychologist, clinical social worker, or other certified mental health professional. Any OP mental health care is defined as either a visit with a mental health practitioner or other non-ER OP care with a primary mental health diagnosis. Other OP health care includes all non-ER OP care that does not meet the criteria above for mental health care; this category generally covers physical health conditions but could include OP care with a substance use diagnosis. Most IPF patients receive outpatient mental health care during the year. In 2008, nearly two-thirds of IPF patients had an outpatient visit with a mental health practitioner--a psychiatrist, psychologist, social worker, psychiatric nurse, or physician assistant with a psychiatric specialty (Figure 2). Around three-quarters of IPF patients had any outpatient mental health care, either with a mental health practitioner or another type of provider, such as a primary care doctor. The majority (92 percent) of IPF patients received some other outpatient care during the same period, generally for physical health conditions. These use rates do not vary substantially between patients of psychiatric units versus freestanding IPFs. What care do Medicare beneficiaries receive directly before and after their IPF stay? The majority of IPF admissions come from physician referrals or emergency rooms. In 2008, 38 percent of IPF admissions came from a physician referral, and another 35 percent came from the emergency room (Figure 3). Rates of IPF admission from the emergency room were much higher in psychiatric units compared with freestanding IPFs (45 percent versus 12 percent, respectively; not shown). This finding likely reflects, in part, general hospitals' common practice of admitting psychiatric patients through the emergency room or "boarding" patients in swing beds in the emergency room until space becomes available in psychiatric units (American College of Emergency Physicians, 2014). Most IPF patients are discharged to their home or to self-care. Around 70 percent of beneficiaries were discharged from IPFs to their home or to self-care, compared with by 11 percent discharged to SNFs, 5 percent discharged to intermediate care facilities (ICF), and 6 percent discharged to inpatient settings (Figure 3). 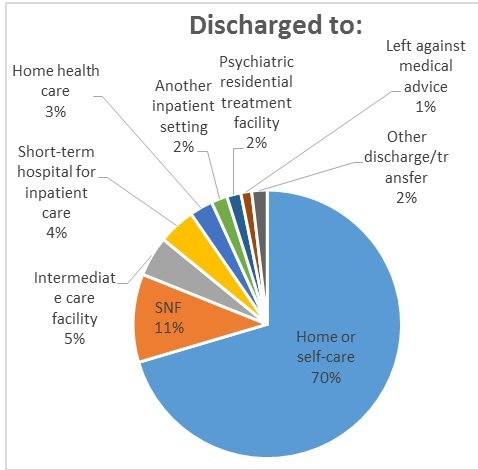 Consistent with the findings mentioned earlier, a higher proportion of beneficiaries who received care from psychiatric units were discharged to a SNF (compared with freestanding IPFs), and a lower proportion were discharged to their home or to self-care (not shown in Figure 3). SOURCE: Patient discharge and admission status codes from Medicare Part A inpatient IPF claims for Medicare FFS beneficiaries who had 1 or more IPF discharges in calendar year 2008. NOTES: Sample size is 462,688 FFS Medicare discharges from January 1 to December 31, 2008. This is a discharge-level table, with 1 observation per discharge. A much larger share of beneficiaries are discharged to SNFs than admitted from them. Only 2 percent of patients were transferred to IPFs directly from SNFs, whereas 11 percent of IPF patients were discharged to a SNF from the IPF (Figure 3). Similar findings emerge from an analysis of all Part A and B claims (as opposed to only IPF admission and discharge codes): SNF use among FFS Medicare beneficiaries is more than twice as high in the 30 days after IPF discharge compared with the 30 days before IPF admission (17 percent after discharge versus only 6 percent before discharge; see Figure 4). What care do Medicare beneficiaries receive in the 30 days before and after their IPF stay? Around one-third of beneficiaries have some type of inpatient care--either an IPF stay or an acute care stay--in the 30 days before their IPF stay, and around one-quarter have an inpatient stay in the 30 days after their IPF stay. Twenty-seven percent of Medicare FFS beneficiaries who received care in IPFs had an IPF stay or a non-IPF acute care hospital stay in the 30 days after their IPF discharge (Figure 4). This readmission rate is notably higher than the national 30-day all-cause hospital readmission rate for Medicare FFS beneficiaries, which averaged 19 percent from 2007 to 2011 (Gerhardt et al., 2013). Direct transfers to the IPF from acute care settings (and vice versa) likely account for some of the non-IPF hospital care in the 30 days before and after IPF stays. Emergency room visits are common 30 days before and after the IPF stay. Two-thirds of IPF patients had an emergency room visit in the 30 days before their IPF stay, and 29 percent had an emergency room visit in the 30 days after their IPF discharge (Figure 4). This rate of emergency room use following an IPF stay is higher than the 30-day emergency room rate among patients discharged from non-IPF hospitals, estimated at 18 percent of discharges (Rising et al., 2013). (However, this statistic for non-IPF hospitals is based on a study that was not limited to Medicare populations.) Direct transfers from the emergency room to the IPF likely account for around half of the emergency room use before the IPF stay. Less than 40 percent of IPF patients visit a mental health practitioner in the 30 days before or after their IPF stay. Only 30 percent of IPF patients visited a mental health practitioner--a psychiatrist, psychologist, or clinical social worker--in the 30 days before their IPF stay, and 37 percent did so in the 30 days afterwards (Figure 4). The slightly higher receipt of care after the IPF stay (versus before it) could reflect a wide range of factors, including patients' efforts to get necessary follow-up care directly after their IPF stay, as well as IPFs' efforts to connect recently discharged patients with mental health practitioners. However, these analyses reflect only Medicare-reimbursed mental health services; some patients may receive mental health care outside of Medicare reimbursement. NOTE: Sample size is 372,311 FFS Medicare IPF discharges from January 31 to December 1, 2008. This is a discharge-level table, with 1 observation per discharge in the designated time period. ER visits were counted without regard for diagnosis (all were included). A visit with a mental health practitioner includes an OP visit, an intensive OP encounter, or a partial hospitalization with a psychiatrist, psychologist, clinical social worker, or other certified mental health professional. Any OP mental health care is defined as either a visit with a mental health practitioner or other non-ER OP care with a primary mental health diagnosis. Other OP health care includes all non-ER OP care that does not meet the criteria above for mental health care; this category generally covers physical health conditions but could include OP care with a substance use diagnosis. Slightly more than half of IPF patients receive other outpatient care in the 30 days before or after their IPF stay. 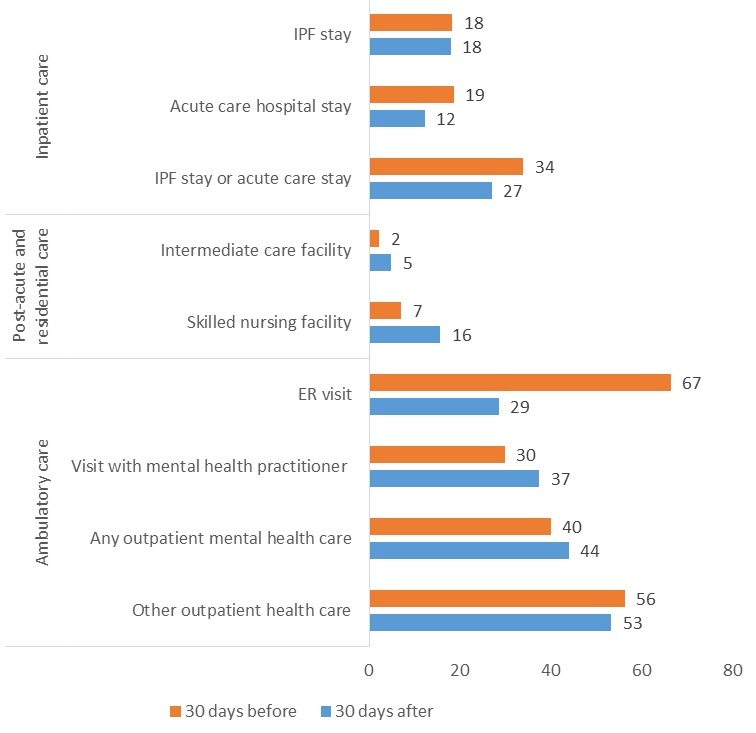 In the 30 days before their IPF stay, 56 percent of beneficiaries received outpatient care that was not with a mental health practitioner or did not involve a primary mental health diagnosis, and 53 percent received such care in the 30 days afterwards (Figure 4). In contrast, only 40 percent of beneficiaries received outpatient mental health services--a visit with a mental health practitioner or other outpatient care with a primary mental health diagnosis--in the 30 days before the IPF stay, and only 44 percent received outpatient mental health care within 30 days following the stay. Besides the main analysis of all FFS Medicare beneficiaries discussed above, we used Medicare and Medicaid claims to examine the use of services among dual-eligible beneficiaries who visited IPFs in 2008. These beneficiaries accounted for 56% of all FFS Medicare beneficiaries who visited IPFs. In 2008, 91% of dual-eligible beneficiaries had an ER visit, 45% had an acute care hospital stay, and 23% stayed at a SNF. In addition, nearly 70% of dual-eligible beneficiaries saw a mental health practitioner in 2008. 68% of dual-eligible beneficiaries had an ER visit in the 30 days before the IPF stay, and 33% had an ER visit in the 30 days after the IPF stay. 32% saw a mental health practitioner in the 30 days before their IPF stay, and 39% did so in the 30 days after their IPF stay. In 2008, 29% of dual-eligible beneficiaries had an OP visit with a primary mental health or substance use diagnosis, and 45% had OP care without a primary mental health or substance use diagnosis. 13% of dual-eligible beneficiaries had a visit with a primary mental health or substance use diagnosis in the 30 days before their IPF stay, and 14% had such a visit in the 30 days after their stay. * These are: Alaska, Alabama, Arkansas, California, Connecticut, District of Columbia, Delaware, Florida, Georgia, Idaho, Illinois, Indiana, Kentucky, Louisiana, Massachusetts, Maryland, Michigan, Missouri, Mississippi, North Carolina, North Dakota, Nebraska, New Hampshire, New Jersey, New Mexico, New York, Ohio, Oklahoma, South Carolina, Texas, Virginia, Washington, Wisconsin, West Virginia, and Wyoming. The findings from these analyses have several implications for quality measurement and improvement efforts targeted to Medicare beneficiaries who receive care from IPFs. Medicare beneficiaries who receive care in IPFs have complex health care needs, as indicated by their co-occurring conditions and their use of health care services. IPFs serve populations with diverse diagnostic and demographic characteristics. It is particularly notable that nearly one-quarter of all Medicare IPF patients (and 31 percent of these patients in freestanding IPFs) have a substance use disorder. This may present an opportunity for IPFs to address these conditions during the inpatient stay. Likewise, one-quarter of all Medicare IPF patients (and 30 percent of patients in psychiatric units) have Alzheimer's or dementia. Although some IPFs--particularly psychiatric units--have specialized geriatric services and units dedicated to this population, others treat these individuals along with the general population. Given the size of this population in some IPFs, there may be opportunities to address these patients' needs and monitor their quality of care. Compared with all FFS Medicare beneficiaries, Medicare beneficiaries who receive care in IPFs use emergency room and inpatient services a lot throughout the year, particularly before and after IPF stays. In particular, IPF patients' high rates of emergency room use in the 30 days after the IPF stay (29 percent)--and repeat IPF hospitalizations within 30 days (18 percent)--are undesirable outcomes. To address the repeat hospitalizations, CMS is developing and testing a 30-day readmission measure for the Inpatient Psychiatric Facility Quality Reporting program. Relatively high use of the emergency room 30 days after an IPF stay could be an additional area for quality improvement. Many Medicare beneficiaries are not engaged in mental health services directly before their IPF stay. Despite high rates of inpatient and ambulatory service use over the course of a year, only 30 percent of FFS Medicare beneficiaries saw a Medicare-reimbursed mental health practitioner--a psychiatrist, psychologist, or clinical social worker--in the 30 days before their stay. And only 40 percent received any Medicare-reimbursed mental health care as an outpatient (any visit with a mental health practitioner or other outpatient care with a primary mental health diagnosis) during the same time frame. (However, 13 percent of dual-eligible beneficiaries had a Medicaid-reimbursed visit with a primary mental health or substance use diagnosis in the 30 days before their IPF stay). Although we do not have access to data on service use outside of Medicare and Medicaid reimbursement, this finding may suggest that many beneficiaries are not receiving routine mental health services that could prevent them from requiring inpatient care. Medicare beneficiaries who receive care in IPFs have high rates of service use for other conditions; this may present opportunities to address their mental health needs. Fifty-six percent of FFS Medicare beneficiaries received outpatient health care unrelated to mental health in the 30 days before their IPF stay; this is nearly double the percentage who visited a Medicare mental health practitioner during the same period. This presents an opportunity to address mental health issues concurrently with physical health issues in outpatient settings. In recent years, several health care models have emerged with the potential to provide more holistic care. For example, the CMS-sponsored Comprehensive Primary Care Initiative offers primary care providers financial incentives to work with behavioral health specialists in delivering person-centered care (Older Americans Behavioral Health Technical Assistance Center, 2012). Medical homes and health homes may also provide similar opportunities. IPFs often serve as a gateway to SNF care. A much larger proportion of IPF patients are discharged to SNFs than admitted from them. Furthermore, SNF use among FFS Medicare beneficiaries is more than twice as high in the 30 days after IPF discharge than in the 30 days before. The progression from IPFs to SNF care may be warranted for beneficiaries who need medication assistance, close supervision after their IPF stay, or help with daily activities. However, there is growing concern that SNFs are not equipped to provide specialized psychiatric care to these beneficiaries. Given this concern, CMS has limited the compensation SNFs can receive for serving IPF patients who enter SNFs with a primary psychiatric diagnosis (CMS, 2015). Further research could focus on the IPF-to-SNF progression in more depth, with an emphasis on: (1) identifying common mismatches between beneficiaries' psychiatric care needs and SNF capacity and expertise; and (2) assessing alternate treatment arrangements for Medicare beneficiaries recently discharged from IPFs. The findings from these analyses provide a baseline from which to measure progress in follow-up care and readmission rates after an IPF stay. The findings also identify opportunities for closer monitoring of patterns and quality of care among subpopulations. These subpopulations include those with substance use disorders as well as Alzheimer's disease and related dementias, who account for a large proportion of Medicare beneficiaries receiving care in IPFs. Future quality monitoring and improvement efforts should take into account: (1) the diagnostic and demographic heterogeneity of the IPF population; and (2) the care provided to particularly vulnerable subgroups, who may require additional supports to avoid institutional care. Further research is needed to understand how service use and quality of care for the IPF population may vary by state and region, and how use rates and quality may change over time as various quality measures and payment reforms affect the delivery of care. American College of Emergency Physicians (2014). Care of the Psychiatric Patient in the Emergency Department--A Review of the Literature. https://www.acep.org/uploadedFiles/ACEP/Clinical_and_Practice_Management/Resources/Mental_Health_and_Substance_Abuse/Psychiatric%20Patient%20Care%20in%20the%20ED%202014.pdf (accessed September 10, 2016). Brennan J, Chan T, Killeen J, Castillo E (2015). 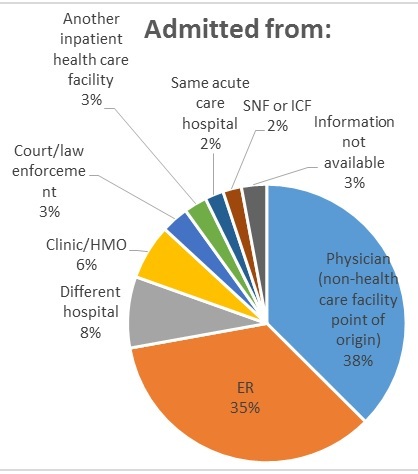 Inpatient readmissions and emergency department visits within 30 days of a hospital admission. Western Journal of Emergency Medicine, 16(7): 1025-1029. Centers for Medicare & Medicaid Services (CMS) (2010). Medicare Benefit Policy Manual, Chapter 2--Inpatient Psychiatric Services. Centers for Medicare & Medicaid Services (CMS) (2011). Chronic Conditions Among Medicare Beneficiaries. Baltimore, MD: CMS. Centers for Medicare & Medicaid Services (CMS) (2015). The Medicare Benefit Policy Manual: Coverage of Extended Care (SNF) Services Under Hospital Insurance. https://www.cms.gov/Regulations-and-Guidance/Guidance/Manuals/downloads/bp102c08.pdf (accessed September 10, 2016). Chronic Conditions Data Warehouse. Table A.1.a. Medicare Beneficiary Counts for 2005-2014. Baltimore, MD: Centers for Medicare & Medicaid Services: 2014. Available at https://www.ccwdata.org/web/guest/medicare-tables-reports (accessed June 29, 2016). Gerhardt G, Yemane A, Hickman P, Oelschlaeger A, Rollins E, Brennan N (2013). Data shows reduction in Medicare hospital readmission rates during 2012. Medicare & Medicaid Research Review, 3(2): E1-E12. https://www.cms.gov/mmrr/downloads/mmrr2013_003_02_b01.pdf (accessed September 10, 2016). Health Resources and Services Administration (2016). Shortage Designation: Health Professional Shortage Areas and Medically Underserved Areas/Populations. http://www.hrsa.gov/shortage/ (accessed September 10, 2016). Medicare Payment Advisory Commission (2010). Report to Congress: Medicare Payment Policy. http://www.medpac.gov/-documents-/reports?op=OR&SortBy=YEAR&SortDirection=DESC&FilterByYear=2010 (accessed September 10, 2016). Moran Company (2014). Medicare Psychiatric Patients and Readmissions in the Inpatient Psychiatric Facility Prospective Payment System. https://naphs.org/resourcemanager/handlerresource.aspx?id=408 (accessed September 12, 2016). Older Americans Behavioral Health Technical Assistance Center (2012). Issue Brief 1: Aging and Behavioral Health Partnerships in the Changing Health Care Environment. http://www.aoa.gov/AoA_Programs/HPW/Behavioral/docs2/Issue%20Brief%201%20Partnerships.pdf (accessed September 10, 2016). Rising KL, White LF, Fernandez WG, Boutwell AE (2013). Emergency department visits after hospital discharge: A missing part of the equation. Annals of Emergency Medicine, 62(2): 145-50. Your Medicare Coverage (n.d.). https://www.medicare.gov/coverage/inpatient-mental-health-care.html. The sample for this analysis included 303,096 FFS Medicare beneficiaries who had 462,688 Medicare-paid IPF stays in 2008. We defined these beneficiaries as people with FFS Part A and B coverage during at least 6 months in 2008. We defined IPFs as standalone IPFs or IPF units that received reimbursement under the Medicare Inpatient Psychiatric Facility Prospective Payment System in 2008. Restricting the sample to FFS Medicare beneficiaries with Part A and B coverage during all 12 months in 2008 would result in a similar sample of 295,532 people with 450,691 discharges. For this analysis, we defined dual-eligible beneficiaries as people with: (1) FFS Medicare Part A and B coverage during at least 6 months in 2008; and (2) FFS or managed care Medicaid coverage during at least 6 months in 2008. We drew our information on these individuals from the monthly coverage information in the Medicare Enrollment Database and the Medicaid Analytic eXtract Person Summary File. Our analysis of dual-eligibles' Medicare-reimbursed care includes all members of this population. However, we limited the analysis to dual-eligible beneficiaries who: (1) have FFS Medicare and FFS Medicaid coverage during at least 6 months in 2008; and (2) reside in the 35 states for which complete Medicaid claims data are available. Notably, dual-eligible beneficiaries with Medicaid managed care are excluded from the analysis of Medicaid reimbursed care, under the assumption that their Medicaid-reimbursed service use is not reflected in Medicaid claims. Rural and low-income counties. We defined a rural county as non-metropolitan, according to the metro/micro indicator variable in the Area Health Resource File. A low-income county is a county with a median household income of lower than $39,000, according to the 2008 median household income variable in the Area Health Resource File. The $39,000 amount is the income cutoff used by the Healthcare Cost and Utilization Project to estimate low socioeconomic status at the county level in 2008. Mental health shortage areas. This designation is based on the population size and number of psychiatrists in an area. If an area has 30,000 or more people per psychiatrist, it can be designated as a mental health shortage area (Health Resources and Services Administration, 2016). We coded IPFs as being located in such an area if they were fully or partially located in a mental health shortage area as determined by the Health Resources and Service Administration (according to the 2009 data element, F12492-09, in the Area Health Resource File). NOTE: A visit with a mental health practitioner in the analysis above is defined as a procedure or revenue code in this table performed by a mental health practitioner in Table A.6, unless an exception is noted. NOTE: A visit with a mental health practitioner in the analysis above is defined as a procedure or revenue code in Table A5 performed by a mental health practitioner in this table, unless an exception is noted. NOTE: These codes are used to define any OP mental health care (when combined with a mental health diagnosis) and other OP care (when not combined with a mental health diagnosis) in the analysis above. At the beginning of this project, 2008 was the most recent year for which Medicare claims were available. This difference in age is likely due in part to the high proportion of dual-eligible beneficiaries with disabilities who receive care from IPFs (Table 2). Dual-eligible beneficiaries tend to be younger, on average, than all Medicare FFS beneficiaries. These length of stay calculations include IPF stays that began before 2008. This brief was prepared under contract #HHSP23320100019WI between ASPE and Mathematica Policy Research. For additional information about this subject, you can visit the DALTCP home page at https://aspe.hhs.gov/office-disability-aging-and-long-term-care-policy-daltcp or contact the ASPE Project Officers, Laurel Fuller and D.E.B. Potter, at HHS/ASPE/DALTCP, Room 424E, H.H. Humphrey Building, 200 Independence Avenue, S.W., Washington, D.C. 20201; Laurel.Fuller@hhs.gov.